Controlling outbound network access is an important part of an overall network security plan. For example, you may want to limit access to web sites. Or, you may want to limit the outbound IP addresses and ports that can be accessed. Application rules that define fully qualified domain names (FQDNs) that can be accessed from a subnet. Network rules that define source address, protocol, destination port, and destination address. Network traffic is subjected to the configured firewall rules when you route your network traffic to the firewall as the subnet default gateway. For this tutorial, you create a simplified single VNet with three subnets for easy deployment. For production deployments, a hub and spoke model is recommended, where the firewall is in its own VNet. The workload servers are in peered VNets in the same region with one or more subnets. AzureFirewallSubnet - the firewall is in this subnet. Workload-SN - the workload server is in this subnet. This subnet's network traffic goes through the firewall. Jump-SN - The "jump" server is in this subnet. The jump server has a public IP address that you can connect to using Remote Desktop. From there, you can then connect to (using another Remote Desktop) the workload server. If you prefer, you can complete this tutorial using Azure PowerShell. First, create a resource group to contain the resources needed to deploy the firewall. Then create a VNet, subnets, and test servers. The resource group contains all the resources for the tutorial. On the Azure portal home page, select Resource groups > Add. For Resource group name, type Test-FW-RG. For Subscription, select your subscription. For Resource group location, select a location. All subsequent resources that you create must be in the same location. This VNet will contain three subnets. From the Azure portal home page, select Create a resource. Under Networking, select Virtual network. For Address space, type 10.0.0.0/16. For Resource group, select Test-FW-RG. For Location, select the same location that you used previously. Under Subnet, for Name type AzureFirewallSubnet. The firewall will be in this subnet, and the subnet name must be AzureFirewallSubnet. For Address range, type 10.0.1.0/24. Accept the other default settings, and then select Create. The minimum size of the AzureFirewallSubnet subnet is /26. Next, create subnets for the jump server, and a subnet for the workload servers. On the Azure portal home page, select Resource groups > Test-FW-RG. Select the Test-FW-VN virtual network. For Address range, type 10.0.2.0/24. Create another subnet named Jump-SN, address range 10.0.3.0/24. Now create the jump and workload virtual machines, and place them in the appropriate subnets. On the Azure portal, select Create a resource. Select Compute and then select Windows Server 2016 Datacenter in the Featured list. Under Inbound port rules, for Public inbound ports, select Allow selected ports. For Select inbound ports, select RDP (3389). Accept the other defaults and select Next: Disks. Accept the disk defaults and select Next: Networking. Make sure that Test-FW-VN is selected for the virtual network and the subnet is Jump-SN. For Public IP, accept the default new public ip address name (Srv-Jump-ip). Accept the other defaults and select Next: Management. Select Off to disable boot diagnostics. Accept the other defaults and select Review + create. Review the settings on the summary page, and then select Create. Use the information in the following table to configure another virtual machine named Srv-Work. The rest of the configuration is the same as the Srv-Jump virtual machine. Deploy the firewall into the VNet. From the portal home page, select Create a resource. Select Firewall and then select Create. Public IP address Create new. The Public IP address must be the Standard SKU type. Review the summary, and then select Create to create the firewall. This will take a few minutes to deploy. After deployment completes, go to the Test-FW-RG resource group, and select the Test-FW01 firewall. Note the private IP address. You'll use it later when you create the default route. For the Workload-SN subnet, configure the outbound default route to go through the firewall. From the Azure portal home page, select All services. Under Networking, select Route tables. Select Refresh, and then select the Firewall-route route table. Select Subnets and then select Associate. Select Virtual network > Test-FW-VN. For Subnet, select Workload-SN. Make sure that you select only the Workload-SN subnet for this route, otherwise your firewall won't work correctly. Select Routes and then select Add. For Route name, type fw-dg. For Address prefix, type 0.0.0.0/0. For Next hop type, select Virtual appliance. Azure Firewall is actually a managed service, but virtual appliance works in this situation. For Next hop address, type the private IP address for the firewall that you noted previously. This is the application rule that allows outbound access to www.google.com. Open the Test-FW-RG, and select the Test-FW01 firewall. On the Test-FW01 page, under Settings, select Rules. Select the Application rule collection tab. Select Add application rule collection. Under Rules, Target FQDNs, for Name, type Allow-Google. For Source Addresses, type 10.0.2.0/24. For Protocol:port, type http, https. Azure Firewall includes a built-in rule collection for infrastructure FQDNs that are allowed by default. These FQDNs are specific for the platform and can't be used for other purposes. For more information, see Infrastructure FQDNs. This is the network rule that allows outbound access to two IP addresses at port 53 (DNS). Select the Network rule collection tab. Select Add network rule collection. Under Rules, for Name, type Allow-DNS. For Destination Ports, type 53. For testing purposes in this tutorial, configure the server's primary and secondary DNS addresses. This isn't a general Azure Firewall requirement. 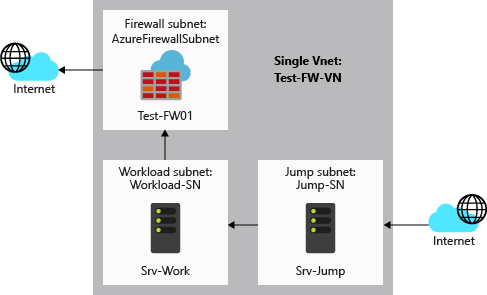 From the Azure portal, open the Test-FW-RG resource group. Select the network interface for the Srv-Work virtual machine. Under Settings, select DNS servers. Under DNS servers, select Custom. Type 209.244.0.3 in the Add DNS server text box, and 209.244.0.4 in the next text box. Restart the Srv-Work virtual machine. Now, test the firewall to confirm that it works as expected. From the Azure portal, review the network settings for the Srv-Work virtual machine and note the private IP address. Connect a remote desktop to Srv-Jump virtual machine, and sign in. From there, open a remote desktop connection to the Srv-Work private IP address. Open Internet Explorer and browse to http://www.google.com. Select OK > Close on the Internet Explorer security alerts. You should see the Google home page. You should be blocked by the firewall. You can browse to the one allowed FQDN, but not to any others. You can resolve DNS names using the configured external DNS server. You can keep your firewall resources for the next tutorial, or if no longer needed, delete the Test-FW-RG resource group to delete all firewall-related resources.